Spot price silver has continued to struggle to break above the $17.50 per ounce level with yesterday’s price action constrained within a very tight trading range. However, it is interesting to note that in the last week or so the 9 day average in particular has provided excellent support during the daily trading session, and in addition any test lower has found solid support from the 14 day moving average below. 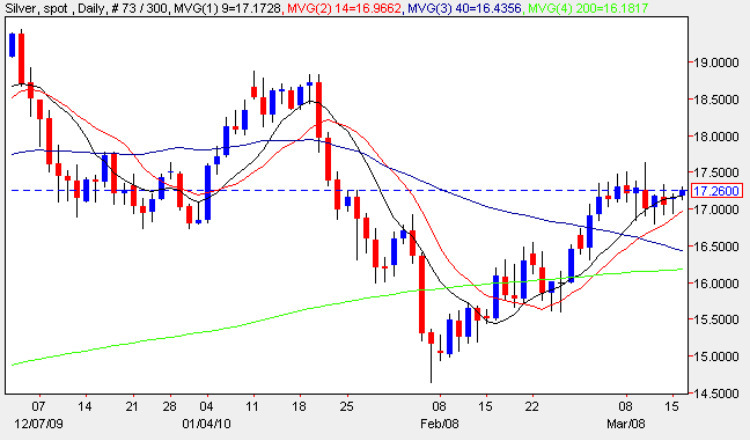 All this suggests that we should see a move higher for silver prices in due course particularly as we continue to maintain a level above all four moving averages. The key technical price areas for any move higher continue to be a break above resistance in the $17.75 area followed by further price congestion between $18 and $18.65. If both these are cleared then we should see a run up to re-test the top at $19.30 last seen towards of November 2009.